The U.S. government’s budget deficit widened in the first eight months of the fiscal year, reflecting lower revenue from corporate taxes combined with ramped-up government spending. The deficit, or the difference between the amount of money the federal government spent and what it took in, totaled $532.24 billion in October through May, the Treasury Department said Tuesday. That was 23% more than the deficit of $432.85 billion during the same period a year earlier. Comparing the U.S. government’s cumulative tax collections and spending in its 2018 fiscal year with the previous fiscal year, however, reveals a different picture. 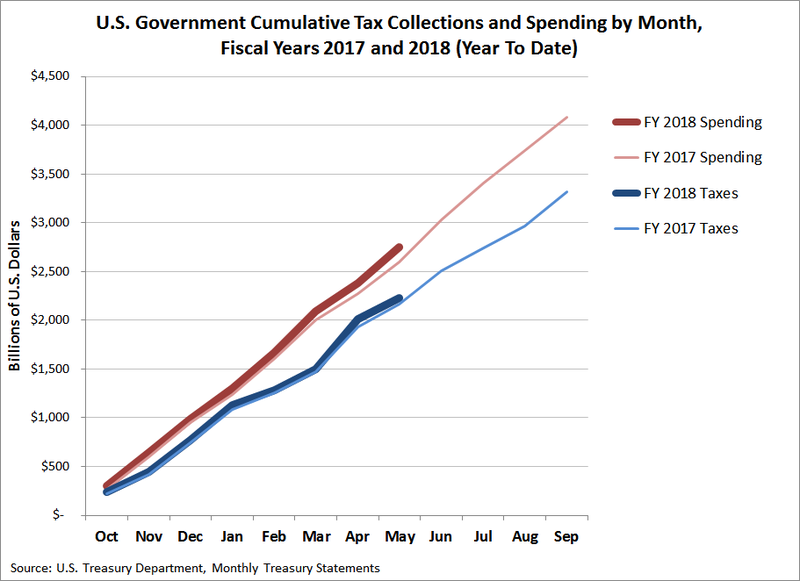 Here, we see that the U.S. government’s tax collections in its 2018 fiscal year are running ahead of where they were in 2017, which has been true for every month of the government’s 2018 fiscal year to date. But so has the federal government’s spending, which has cumulatively increased by a much larger amount, especially since February 2018. It is the increased spending that is primarily responsible for driving up the government’s budget deficit and the national debt. What is happening today is not a new problem. Six years ago, consumer advocate John Stossel wrote a column with the title “It’s the Spending, Stupid!“ that pretty much exactly describes the kind of political thinking in Washington D.C. that leads to the outcomes of bigger budget deficits and an ever-growing national debt. If you updated the dollar amounts, the name of the President and the offices held by two of the then just-elected officials mentioned in the article, it would read as if it were just written yesterday. To succeed, the crusade to cut spending needs an ideological understanding of how unsustainable our current course is, not just a narrow appeal to short-term self-interest. People will have to see the wisdom of giving up government benefits now—in exchange for something more abstract: a future free society in which our children won’t be burdened by debt and taxes. Why wouldn’t you want that future free society unburdened by debt and taxes for your children? For that matter, why wouldn’t you want that for yourself and your family today?